If you're not happy with your current layout, why not mix it up a bit. Sometimes new floor plans are all you need to give your home a polished and put together look. Creating a furniture layout can be one of the most difficult parts of making an interior design come together. Maybe you already have all the pieces but you're just not sure how to make them fit together with the right floor plan. Or perhaps you're starting from scratch and wondering how to invest in the right furniture. One of the most important features of a well designed room is having a properly proportioned, well laid out floor plan. At the beginning of a project, before you make a big purchase, it's important to have an idea of how new pieces might fit in your space. 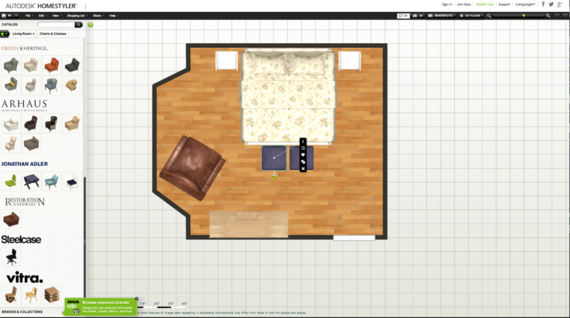 One our our favorite programs for playing around with furniture layout options and floor plans sans heavy lifting is Homestyler. Super easy to use, start by drawing your room dimensions. Add doors and windows, and then start to pick out your furniture. Hoymestyler has a pretty large selection of generic, standard size furniture to play around with. Pop each piece in your room's floor plan, drag it around, and figure out where it works best. Don't get too caught up on picking specific styles or colors of furniture or worrying about how ugly some of the pieces look (yes, I'm talking about that floral duvet up there). Just select pieces that have the general shape and size that you are considering. It's all about flow and placement here, not style. But, you might even luck out and find some designer pieces you're considering for the space, like the Jonathan Adler stools I placed at the foot of the bed, or the Restoration Hardware leather chair in the bay window. Digital layouts are a great place to start because you'll get a general sense of how the floor plan will flow and what you can fit in the space. But sometimes that's just not enough. If you really want to know how tight it's going to feel squeezing between the coffee table and the sofa, break out the painter's tape. The best tip we can give you: tape it out. 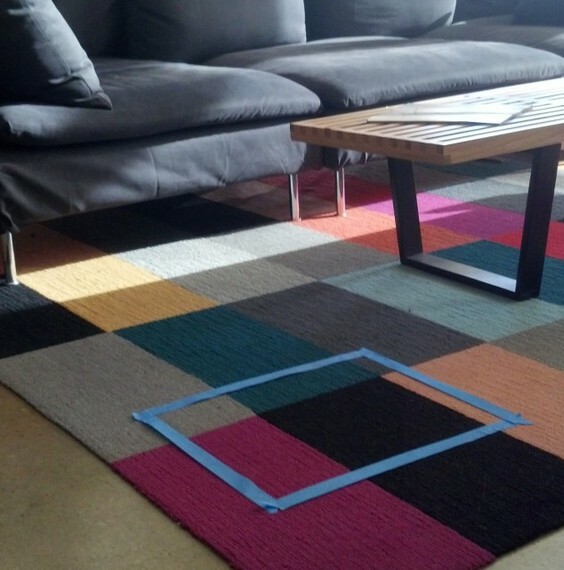 Use painter's tape to create outlines of your furniture on the floor. Taping out your furniture layout makes the floor plans feel a little more real than just seeing them on a computer screen. Walk around the tape, step back and visualize the full pieces in the space. How does it feel? This is also a great way to get an idea of how pieces will look against the wall. Tape out the outline of a headboard or a dresser-or even a gallery wall to see how it fills the space. Sometimes there's just no substitute for actually seeing the furniture in the space. This isn't the best plan to go with if you are ordering a bunch of new pieces, though. But if you're trying to rearrange a room with furniture you already have, pop a couple of furniture sliders (or an old towel) under the legs and start pushing. 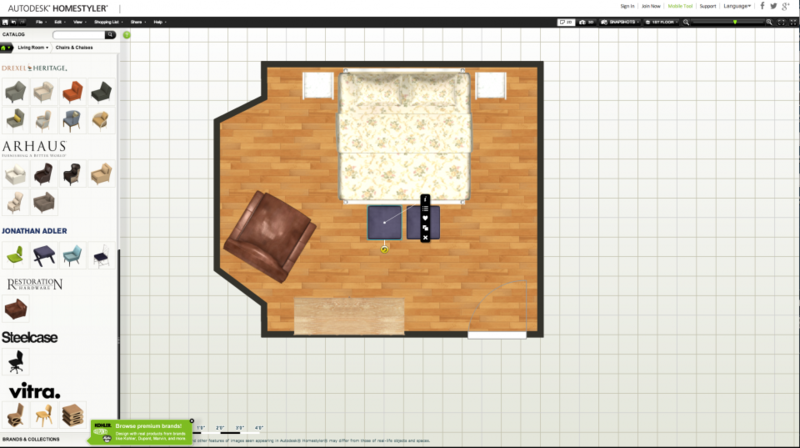 Use Homestyler and tape to narrow it down to a few possible floor plans, then try them in the space. Walk around your new furniture layout, sit on each piece, leave the room and come back in a few times. Take notice of the focal points (good and bad). Write down your thoughts and snap a few pics before you switch it up, so you can compare before you decide on the best floor plan. If you're not happy with your current layout, why not mix it up a bit. Sometimes new floor plans are all you need to give your home a polished and put together look. Do you have your own tips on how to create an ideal floor plan? Drop me a line!